Make portion control a breeze with our collection of portion spoons! 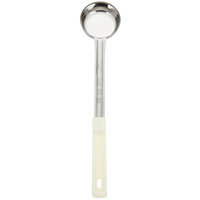 This 3 oz., solid, ivory portion spoon is one-piece and can be used to measure food for both wet and dry portion control. It has a color-coded handle for easy identification and kitchen organization! The colored handle eliminates the stress over spending too much time searching for the right spoon. Looking for a way to serve evely and this is it. This server gets the job done and equall portions. Sturdy and handles well. looks great. This is a great scoop! Price is super affordable and the quality was not compromised which is pretty important for any kitchen supply you buy. These really help to regulate how much of the product is being used. It really helps with making sure that your food Cost & guest portion expectation is met. When it comes to dieting, getting the right portion size can be a challenge. What we think is the appropriate amount can be more than what we need. The 3 oz. helps balance between what we need and what we measure. Slowly adding to my collection of portion spoons. These are fantastic for precise serving sizes. High quality, low cost. Finding more uses for them every day. This 3oz portion spoon is very good for keeping recipes consistent for line cooks. The color coated handle corresponds with other toools that are also 3oz. These ladles are perfect size for the concessions business. Keeps portions under control eliminated over serving. They are ok to clean smooth back on handle would make easier. these portion spoons are great. they hold up well. they go through the dishwasher without any apparent issues. I highly recommend based on quality AND price. These are nice for maintaining consistent portions. The metal handles are thin though, so they can bend pretty easily if you are not careful with them. This is the 3oz. Portion spoon. Its a must have in any kitchen or restaurant. It really cuts down on food cost since you can get an exact measurement. Very sturdy as well. I love that they r color coded. The portion control spoon is well made and light. Different colored handles tell you what size the spoon is. A white handle is a 3 oz size. Perfect for Nacho Cheese. This one piece portion spoon is both sturdy and easy to clean because it is dishwasher safe. This is the 3 ounce spoon and features a solid bottom which allows liquid to remain in the portion you serve. Because these spoons are color-coded, it makes serving different portions very simple. A solid spoon that I find useful in many ways. I've used this spoon to scoop shorting when making frosting and it's handle is comfortable and the spoon is strong enough to get hit on top of a stainless steel mixing bowl. This size portion spoon, 3 oz, works well for us for applesauce and dressings. I have had it for quite awhile and I love this brand, their kitchen tools I have purchased have held up beautifully. They are sturdy and show no signs whatsoever of rust or melting handles. I can recommend them without reserve ! Good product that allows employees to easily maintain the proper portion control. The handle is color coated to prevent someone grabbing the incorrect spoodle and, therefore, giving the incorrect portion. Otherwise known as a spoodle. These are great portion control tools to help you manage cost. The handles are extra long and provide excellent reach. The 3 oz. One-Piece Solid Portion Spoon is actually one of the best portion spoons that I have purchased. The quality exceeded my expectations. Highly recommend! Tiny but still has a lot of uses. Good for drizzling dresses, sauces, or just measuring out sides. They don't look fancy, but the quality is good and the price is fair. These are good for spooning out just the right amount. They are long spoons. I ordered them in all the available sizes. I have no regrets. A very simple design. It holds up well. The plastic handle covering keeps you safe when using the spoon for hot products. A good item at a good price. This 3 ounce one-piece solid portion spoon is exactly what I needed for portion control measuring. I cook food in bulk [to save time] and freeze in aluminum containers. In the past I always had to wait until the food cooled off because the plastic would warp and the metal would burn my fingers. Not anymore! The cool handle is long enough to scoop the food out of the pots- works quickly to do assemble line portion and I freeze my entrees so I have them later. It is time saver item. I love how the 3 oz. One-Piece Solid Portion Spoon is just the right size. The handle fits so snugly in your hands and makes serving someone a real treat. Another useful and well made utensil from Webstaurant Store. These 3 oz. One-Piece Solid Portion Spoons are great for serving equal amounts of vegetables or sides. A great spoon for serving veggies and certain types of fruits, it has stayed in the water for extended periods of time without any rusting. This is the perfect size to insure portions are balanced our for all of our campers. We love the slightly curved handle to make serving easier. Love these! This portion spoon works great in our restaurant, we use this on some of our high dollar toppings that need to be very precise on the amount that is given, Great product at a great price!!! I really like these spoodles. sturdy stainless construction. flat bottom for easy saucing. color coding and clear labeling makes it easy to grab the correct size quickly. two thumbs up! This spoon is perfect for saucing our 12" pizza. It is sturdy, easy to clean (no gross hidden areas where sauce gets stuck), and the color coding really helps make training people on our pizza line easy! Great 3 oz portion control spoons. We use the 3 oz for lots of side items. They are well made, cleans easily & will probably last a long time. Every restaurant needs portion controls and this one does double duty by scooping and spreading our pizza sauce on the dough. This spoon is a dependable utensil! This three ounce spoodle gives every customer the right amount on their plate. And more importantly it helps you give each customer the same amount.